This book was finished in the tenth year after the end of the Vietnam War. 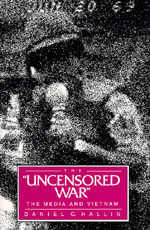 The year 1985 was also the year of Rambo, and of a number of other celebration of the Vietnam War in popular culture. It was the year Congress cut off aid to the "Contras" in Nicaragua, and then abruptly reversed itself and approved "humanitarian" aid to support the guerrilla war in that country. The "Vietnam Syndrome" showed signs of giving way tot he "Grenada Syndrome": the fear of repeating the Vietnam experience showed signs of giving way to a desire to relive it in an idealized form. The nation seemed deeply confused about its identity as an actor in world politics, and thus particularly vulnerable to appealing myths. So it is a good time to take a sober look back and the nation's consciousness during the Vietnam War itself--which as we shall see, despite the popular image of an independent media demolishing the nation's illusions, was also governed by a powerful mythology, born in part out of the traumas of earlier wars.